Hello blogging Friends! It's Wednesday and do you know what that means? 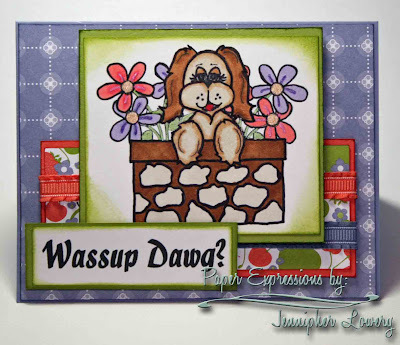 Time for another fabulous challenge at The Perfect Sentiment! The Challenge: Create a card that reflects an "All Occasion" sentiment. Just to clarify this is not the same as "Anything Goes". Some examples of all occasion sentiments are: smile, oh happy day, life is good, just a note, etc. In other words these sentiments aren't tied to a specific occasion or holiday. You could use them for whatever you like. The Twist: Use the following photo as inspiration for your card. You can be inspired by the colors, textures, whatever suits your fancy. We are so pleased to have Robyn's Fetish Digital Stamps as are sponsor for this week! One lucky random winner will receive their choice of 5 digital stamps or 4 digital stamps and 1 paper pack! How Awesome is that? I was inspired by all that fancy trim on those pillows. So I knew I wanted to incorporate ribbon in to my card. But, the biggest inspiration I pulled from that photo was the pillow that was Lime Green with the Purple Ribbon. That sealed the deal for me because I had been dying to use the Lucky Limeade and Wisteria Wonder together. My image is colored with a mixture of copics and glitter gel pens. The more I use copics the less I like them but, I'm learning some tricks from friends oh how you can use them with your Prisma Color Pencils and I think that's the route I will be taking. I created my sentiment on the computer by using a phrase that I found in the Urban Dictionary. I'm thrilled with how it turned out as I don't usually make cutesy cards and I have just the friend to send this too. Once you're inspired come play along at the Perfect Sentiment! You card could be featured as one of the "Perfect 3" or you could be the lucky random winner for the Prize from Robyn's Fetish Digital Stamps! Wow ... these colours are glorious together ... love this cute lil' image and her beautiful long eye lashes - flutter flutter ... great take on our masculine challenge this week! 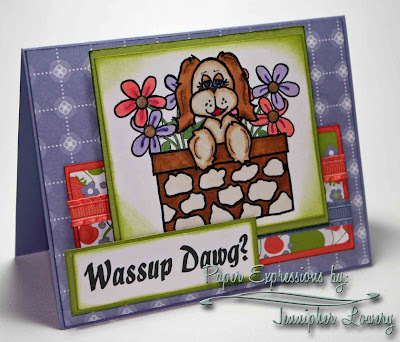 What a cute card with such a cute little image and loving the colors you used with the ribbon. Love it. What a cute little doggie! Great card! This is just adorable Jennipher! LOVE that patterned paper with the cute image too. Great sentiment. Wonderful card! That pillow really caught my eye too! There's just something about those colors that seems like they shouldn't be together, but they are so pretty when they are! Great image! I'm still struggling with learning how to use my copics, so if you gain any wonderful tips, please share!! Super colors and a great card...love the sentiment. Thanks for joining us this week at Tuesday Throwdown. 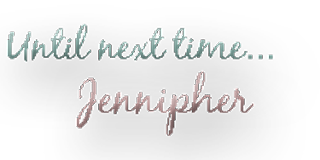 Awww this is so sweet Jennipher! I LOVE that image and the fun sentiment!! Too cute!!! Cute doggy~ Like how you use the ribbons~ Fun sentiment too! Cute doggy-great card! Keep playing with the Copics-maybe you'll grow to love them. This is just too cute from the colors, the design, the beautifully colored image to the sentiment! Adorable card. I love the colors you chose. Sorry I have been a bad cyber-friend. I was out of town for work 2 weeks ago and it is taking me forever to catch up! I love the colors in your inspiration photo! I hope I get time to play this week...just need to finish the house and laundry. pesky chores!! Such a cute card and image! Love your coloring. perfect colors, perfect image, perfect SENTIMENT :) love how this turned out!!! So cute! I love the sweet image and pretty colors you used. Oh my goodness, this is adorable!! Awww! He is super cute! 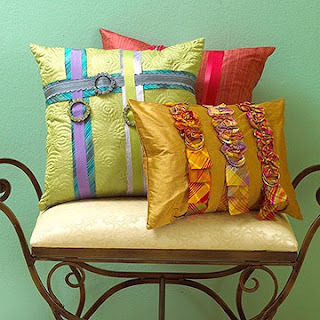 You really captured the trim on that pillow with the ribbon, love it! :) Thanks for popping by my blog, have a great day!